Brrrrrrrrr – it’s cold outside says my Rhododendron! Winter has hit the Valley (and much of the rest of the country) with a vengeance this week. Thanks to a deep trough in the jet stream, bitter cold air has funneled down from Canada and invaded as far south as the Gulf States. Time for us to bundle up in our hats and gloves and warm winter coats! I guess that’s one way to get us in the holiday spirit! 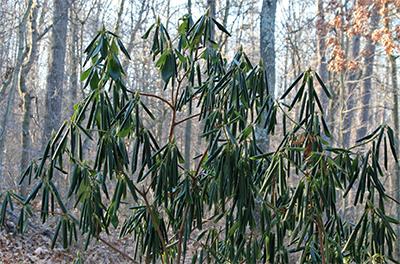 When temperatures are below 20 degrees, the rhododendron leaves are curled up tight. Interestingly enough, plants have their own way of coping with the cold weather. Take Rhododendron for instance – just ’cause I think this is really cool! These broad-leaved evergreens have always intrigued me with their temperature-sensitive leaf movements. 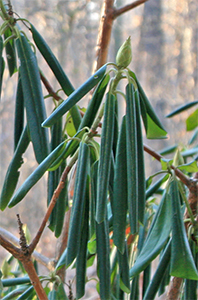 In cold hardy species of Rhododendron, the thick, evergreen leaves begin to droop and curl as the temperature approaches freezing, and the colder the temperature, the tighter they curl and the more they droop. My mom first taught me about this when I was little growing up in New Jersey. We had a lot of beautiful rhododendrons planted in our yard and we always thought it was neat the way the leaves curled up tight and hung down like little green cigars in the winter. When the temperature drops down close to freezing the rhododendron leaves begin to curl. You can see how they are also drooping. There are several different theories as to why this leaf curling and drooping occurs in rhododendrons but there is no debate that it is temperature related. Many researchers feel that it is a way to protect the leaves from desiccation due to freezing temperatures and drying winter winds. Others believe that it protects delicate cell membranes from damage caused by rapid thawing following a freeze. Their theory is that the curled leaves hanging vertically thaw much slower than flat leaves held horizontally and this protects the cells from freeze damage. Regardless of the reason, I’m happy just to know that they curl when it’s cold and leave it at that because, as it turns out, you can use the degree of “curl” in the leaf to estimate the outside air temperature – a “rhododendron thermometer”! When it's nice and warm out, the leaves are flat and held horizontally to capture the sun's rays. 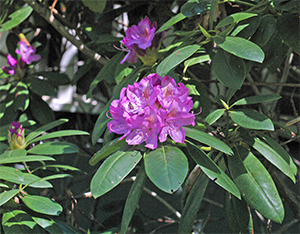 I have my very own “rhododendron thermometer” right outside my bedroom window. Every morning when I wake up in the winter, I can get an idea of how cold it is just by looking out the window at my rhododendron. If the leaves are curled really tight, I know it’s really cold out, at least 20°F or even colder. That’s how they’ve been this past week! Brrrrr! If they are curled just a little, I know it’s not super cold out, maybe just around 30 degrees or so. 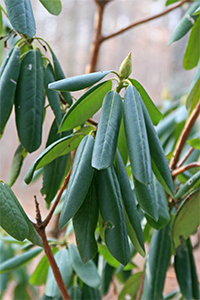 When the temperature is around 40°F or so, the rhododendron leaves just droop a little but are not curled; they don’t usually begin to curl until the temperature drops close to freezing. When it’s nice and warm out, the leaves are flat and held horizontally to capture the sun’s rays. Just some fun plant trivia that might come in handy someday! Happy Gardening and check your “rhododendron thermometer”! A frigid morning has my rhododendron leaves all curled up tight as they can be! An array of bird feeders kept the birds fed during our snowy winter last year! 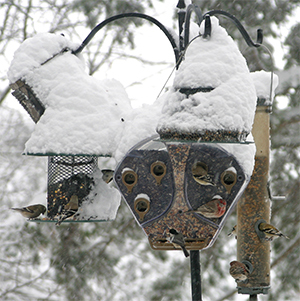 It’s Saturday morning – time to light the gas fire, re-fill the bird feeders on the deck, grab a cup of coffee and sit down in the sunroom to enjoy the birds as they happily nosh on sunflower seeds, thistle seed, and suet! Wintertime is bird feeding time at our house. 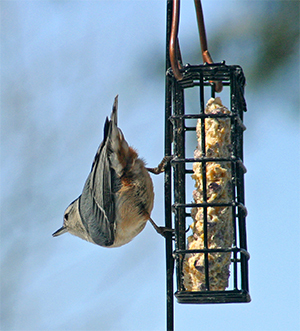 Living in the woods like we do means lots of different bird species visit our feeders. Over the years, we have accumulated many types of bird feeders and they get filled with a variety of different food choices. One thing we have found is that it’s important to choose good quality bird seed that is fresh and free of filler seed that the birds won’t eat. This filler is often composed of weed seeds that get kicked out of the feeder and into your garden! 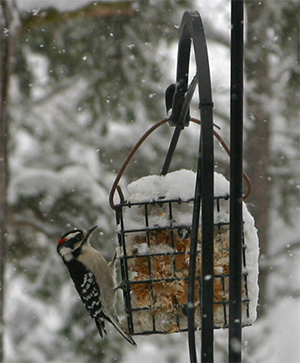 A Downy Woodpecker visits one of the suet feeders. Chickadees, tufted titmice, cardinals, and both the white-breasted and red-breasted nuthatches love the black oil sunflower seeds and the mixed seed filled with sunflower, cracked corn, and other nutritious seeds. The house finches, purple finches, and goldfinches flock to the thistle seed feeders and our suet feeders attract the nuthatches, chickadees, and wrens, as well as four different species of woodpeckers; downy, hairy, red bellied, and even pileated woodpeckers. “Woodpecker Woods” – that’s what we call our place! I think the woodpeckers, the wrens, and the little red-breasted nuthatches are my favorites! A little wren enjoys the suet. We also have several platform feeders for the ground feeding birds such as juncos, mourning doves, blue jays, and sparrows. The jays can be bullies at times and scare some of the smaller birds away but for the most part, they are pretty civil! The squirrels and opossums also like the platform feeders – well, the squirrels actually like all the feeders much to our chagrin. They try their best to empty every one as quickly as they can! The possums mostly nose around for bits of suet that have dropped and tasty morsels on the platform feeders. I guess they need food in the winter too and, well, I must admit that I have a soft spot in my heart for these bird feeder marauders having done field research on both possums and squirrels during my graduate and post-graduate studies! I’m such a softie! 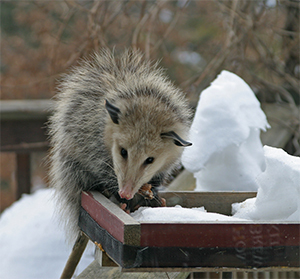 This silly possum was nosing around for some stale bread that we put out for the birds. 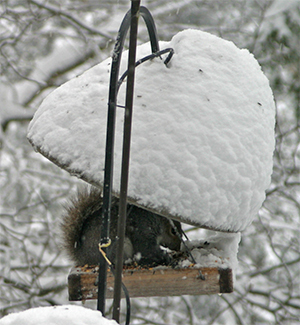 Trying to discourage squirrels from raiding your feeders can be quite a challenge. We’ve had mixed success by hanging candy canes off some of our feeders. The squirrels really don’t like the smell of the peppermint. Some people mix cayenne pepper in with their seed. There are also “squirrel proof” feeders but I’ve found that these guys are so clever and dexterous that they can often find a way to get into a lot of them! I’ve mostly given up at this point! Seems like a good place to chill during a snow storm!! Another thing we have discovered is that providing a big tub of fresh water is really important. It’s often hard for birds to find a source of unfrozen water in the winter and this really helps them out! We keep ours free of ice with a simple bird bath de-icer. It is amazing how much the birds use it. We literally have flocks of bluebirds and cedar waxwings congregating around the water trough all through the winter. Even the squirrels and possums come up for a drink! White-breasted nuthatches love the suet. Once you begin feeding the birds, remember to keep your feeders full throughout the winter as the birds will come to depend on this source of food! 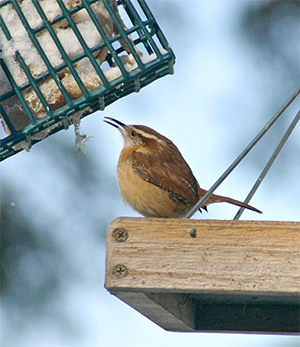 Here are some simple recipes for some tasty treats for your birds this winter. You could also consider planting some seed, fruit, and berry producing trees, shrubs, and perennials throughout your home and gardens. These will not only provide a natural source of food for the birds, but will also give them some great “hiding places”. Happy Gardening and enjoy this beautiful holiday season!! !